Having a successful web site takes marketing savvy. You know your business better than any outsider. You know probably already know how to attract potential customers. Let us help you tell your story! Once your site is on the internet, we'll help you attract visitors with expert search engine submission. We know tricks of the trade to help your rankings. We also know what things NOT to do - no risk of being penalized or banned by search engines. As they say, pictures are worth a thousand words. We can help you get high-quality digital photos of your products or services to show potential customers what you can do for them. 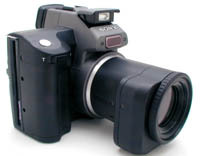 We use a top of the line Sony MVC-FD95 digital camera to take photos that impress. It has the longest focal length zoom lens of ANY digital camera (equivalent to a 400mm lens on a 35mm camera). We can also make short videos to show things a still image cannot. Click on the above camera for an amazing 360 degree QTVR tour! If you already have photos you want to use, we can scan and optimize them for effective use on your web site.